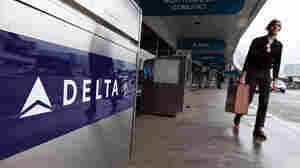 June 6, 2012  That's not to say airlines want more regulation, CEO Richard Anderson said. But they do want a policy that does such things as improve and modernize the air traffic control system. August 31, 2011  And they find it's not the way most airlines have been doing it nor the way you would have guessed. July 5, 2011  If you're trapped in an airport, trying to do math to see if there's a chance you'll make your connecting flight will not help. Such thoughts will not help the plane land or make the volcano stop spewing ash. After a crazy trip, here are Priska Neely's tips. July 4, 2011  Today's Independence Day Talk of the Nation: what the Constitution means in modern times, saying goodbye to the space shuttle, Jim Axelrod on his book, In The Long Run, and what motivates people to visit airport chapels. June 2, 2011  We asked for suggestions on what to do when you're in an airplane and the person in front of you reclines hard and fast into your space. There were many tips. June 1, 2011  If you fly a lot you've had this happen. Seconds after the jet's in the air, the person in front of you reclines his seat. On a flight from Washington to Ghana, that circumstance started a dispute that led to some major consequences. May 9, 2011  On one flight, a man "began yelling and pounding on the cockpit door." In another, a man tried to open a door. 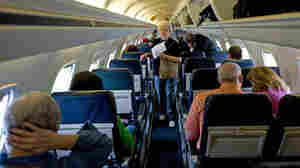 In the third, a passenger says, a note with the word "bomb" was found. 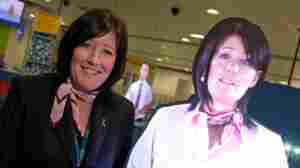 February 3, 2011  Last week, Manchester International Airport started using two holograms of real employees to remind travelers to ditch their liquids. 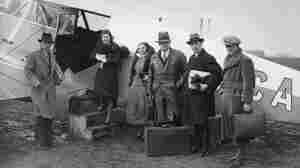 According to Russell Craig, the airport spokesman, it has shown "incredible results" — and has created some confusion.